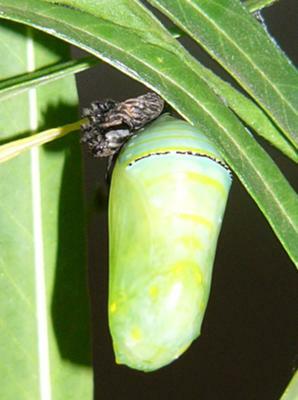 When the monarch butterfly caterpillar is about to make a chrysalis, it turns upside down and the exoskeleton peels off and underneath there is a beautiful light green, soft covering. This is the monarch butterfly chrysalis. It hardens in about two hours and it has some little golden flecks in the light green case. Then it turns a dark greenish blue and in twelve to fourteen days it breaks open and out comes a beautiful buterfly. This is a poem about a butterfly. Came floating gently through the sky. Then drifted close enough to hear. And sail around the way you do. To fly up toward the summer sun. But I have not your graceful charm. I haven't wings, just these two arms. I've been designed to walk around. My human feet must touch the ground. and told me what his wish would be. Or touch my finger to my nose. I haven't arms, just these two wings."